Like so many books on my TBR pile, I wanted to read Will Grayson, Will Grayson co-written by John Green and David Levithan for a long time. And now that I have, I can't believe I waited so long! This book was fun and fabulous and filled with love, life, and heartbreak. The fun of the book started with trying to identify which Will Grayson belonged to which author and it turns out my guesses were right (though I won't reveal it here in case any of you want to figure it out for yourselves). And from there, the greatness continued! 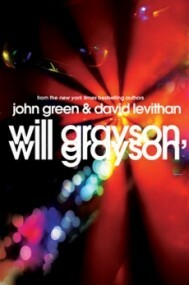 Will Grayson, Will Grayson is a book about exactly that: one Will Grayson and then another. While they're not twins or even relatives, they do share a name. Green handles the point of view of one Grayson and Levithan the other. The way they deliver the stories of these two boys is interesting in both their lives but the actual narration as well. The first Will Grayson follows the typical rules of writing while the second's story is told in sentences that never have capitals. It creates a very stream of consciousness type narrative that juxtaposes the first and stands alone. With a book like this with a complicated story woven between main characters, it is necessary that the two characters be different and the style of writing accomplishes just that! This might be one of my favorite John Green books and that's really saying something because I really really like The Fault in Our Stars and I really love Looking for Alaska. But the best thing about this book is that it's not just limited to one great author, but two! It made this a near perfect read! The characters in this book felt real, filled with flaws, and vulnerabilities, and unique humor that made me laugh out loud. I think my favorite relationship was between the first Will Grayson and his best friend, Tiny Cooper, because it felt like a unique yet authentic friendship and I loved it! But even in all the things that made me happy, I still felt so sad when this was over because I didn't want it to end. And just like life, there were one or two broken hearts within these pages as well. One of my favorite quotes came from this certain kind of heartbreak. I couldn't believe it when I saw that "maybe there's something you're afraid to say, or someone you're afraid to love, or somewhere you're afraid to go. It's gonna hurt. 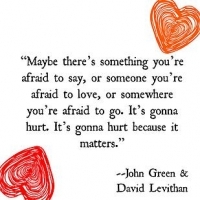 It's gonna hurt because it matters." I love this quote. I've seen it before, foolishly thinking I'd missed it in Paper Towns or in the other books I'd read because I've liked this on Goodreads and reposted it other places. My heart felt so full when I saw this on the page. And it felt just as full when I finished reading this entire beautiful story. If you're looking for something to pull you out of your PTFIOSS (Post Traumatic Fault in Our Stars Syndrome), pick up this book today! Because who hasn't fallen into a kind of book slump after finishing John Green's book? For those of you who've already found your way to this book, you can now find David Levithan's companion story that follows Tiny Cooper. Hold Me Closer is out now! I enjoyed the book my favorite character though was by far Tiny! I bought Will Grayson, Will Grayson by John Green and David Leviathan and, I am writing an honest review. Before opening this book I was a bit confused as to what the story was actually about, now that I’m finished I’m still kind of confused as to what the story was about because there seemed to be a few meanings to it, but either way I loved it! In the first two chapters we meet Will Grayson and will grayson, two very different guys living in two very different worlds. The book is basically about a certain time in both boys lives I guess you would say and we get to learn quite a bit about them, and see some struggles they go through. First we meet Will Grayson and his best friend Tiny (whom is the best gay person I’ve ever met! That’s not a spoiler don’t worry.) The thing about Will, and Tiny is that they have been friends since they were little but they seem to be the kind of best friends (at times) that are drifting apart when they are older. Will is a great character even though he is one of those people who aren’t very proactive he doesn’t stick up for himself, and basically lets people especially his friends sort of walk all over him. Tiny is the complete opposite he’s the kind of guy who doesn’t care what people think of him he’s always talking and always very cheerful which is one of the things that made me love him! Then we meet will grayson and his friend Maura. These were the chapters that were depressing so it kind of balanced out the book. You went from happy cheerful chapters to the depressing I don’t know what to do with myself chapters. will grayson is a very depressed person from the very beginning we find out that he himself is gay and I do think that this has to do with his being so depressed, at first I don’t really think he wants people to look at him differently. Now on to his “friend” Maura, when we first meet her I didn’t have an issue with her she seemed like an okay friend that was treated like crap by her best friend. I can’t say too much because there will be major spoilers so all I can say is she didn’t turn out the way I pictured. One thing I didn’t completely enjoy about the book was that I honestly in the end don’t know what the book was about. Yes there were a few lessons learned and things like that but I still am not clear on what it was about maybe that was the point? Overall though the book gets a 5 out of 5 stars because it was still AMAZING!